I’ve not followed the intermediate legal battles in detail, although they are fascinating, but tomorrow, February 8, 2010, weather permitting the now three race only competition will start for the 33rd time at sea at Valencia, Spain. 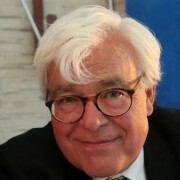 Since I attended part of the 150 year’s America’s Cup celebration in Cowes, UK, in 2001, I’m following it with more than usual interest and you can find me posting about it in my America’s Cup Category here. Off course the official site of the America’s Cup has been revamped entirely and geared towards this event. You can find them at Twitter as well as 33ACup. 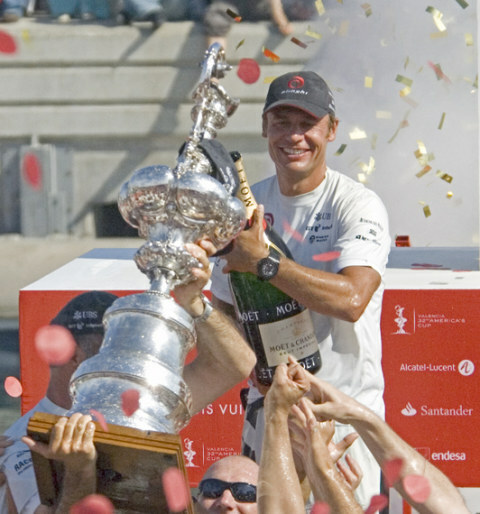 Here you see Bertarelli accepting the Auld Mug at the last edition (32) in 2007. 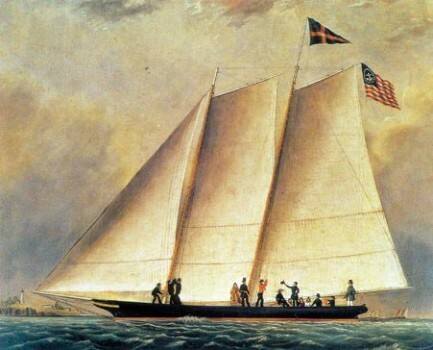 In 1851 the Schooner (I believe Brits say Cutter) America competed against 14 yachts from the UK and won the Auld Mug that later was named after it in a round of the Island Wight race. When she asked her sign master whether the yachts were in sight he answered: “Yes Majesty”. Indicating that honors were only awarded to the winner, but a quote that has ever since this first race been the single motto of this venue. I remember when the America’s cup came to Australia, it was the biggest news ever. Since then I really haven’t followed the race. But the win, that it what counts. Catherine thank you for this kind comment. And you know what? You are the first reader signing up for my weekly newsletter! I’ve put up the widget only yesterday in order to get e-mail newsletter communication into my grip. I hope it will work. The first newsletter is scheduled for February 15 now. Very interesting post, I love that I always learn something new when I read your blog. Next Next post: America’s Cup 33: Spectacular! They Are Racing err Flying!